Hello friends, after a successful completion of the event "Holi Hai", here I come with a new event - Let's Party. "Let's Party" is going to be a monthly event. 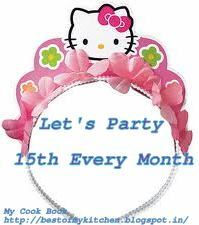 Actually from this month me and some of my friends are organizing Kitty party. And this popped with an idea of Let's Party. Every month we will have different theme for the event. So here I start the event Let's Party with a "Snacks" theme. All this is possible only by your support and interest,friends.So, I invite all my other fellow bloggers who are interested in guest hosting the event for a month with their own theme for that month. The event runs for 1 full month starting from the 15th of the month till 15th next month. You can choose your interested theme for the month. Do drop me a line at surabhishri2003(at)gmail(dot)com if you are interested to host for a month and specifying the theme too so that we can know at the earliest & confirm the months. The link to the round up of event should be sent to me so that I can publish it in the round up page calender at my space too. There are three awards to be given Top Contributor Award, Best Recipe Award, Participation Award. I have choosed "SNACKS" as a theme for the month of Mar-Apr at "Let's Party"
Must be a follower at the Blog or at Facebook. Archives are welcome only if re-posted and linked back to the announcement page(only 1). "Food with a twist\Fusion food"
Nice event.. Will send my entries soon.. Happy hosting!! Lovely event, I try send my entry soon.Happy hosting. Great idea Surabhi. Will participate surely. Superb Event. Will surely participate. Have linked my entry as well. First time here.. wll link something to lets party event.. Do visit my space in your free time. Nice event dear just landed in yous space. Glad to follow you. linking some of my recipes. Dear I am not getting the linki tool so sending you an email. First time here. nice blog ..love this events.. happy hosting ! Hi!I am a new food blogger.Searching for friends.Will u support me?Am following you..